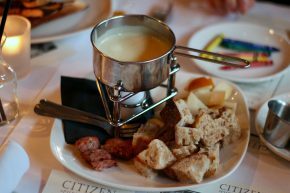 This is how we fondue it. I generally try to avoid fancy restaurants. Really, they just aren’t my thing. But special occasions call for special eats, and so I found myself at Citizen Public House in Old Town Scottsdale in need of some food. And then, like a week later I found myself back there again. No joke, it was crazy. In the grand scheme of the genius of humanity, the Juicy Lucy (a burger stuffed with cheese) must fall somewhere on the spectrum of wonder and destruction as the atomic bomb. Unlike the atomic bomb, however, there can never be too many and there is a bit of confusion about who invented the thing. I already reviewed Matt’s Bar, which spells it without the “i” and with a recent visit to Minneapolis I decided I had to try the 5-8 Club, the other claimant to the origin. There are few regional food items that become so popular that they take on a life of their own outside of said region. And I’m not talking about Mexican food leaving Mexico or pizza making its way into the US from Italy. No, I’m talking Buffalo Wings, New England Clam Chowder and Chicago-Style Deep Dish. 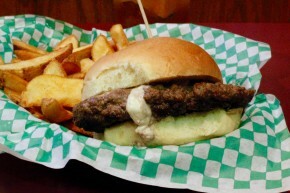 Now, there’s a new one that seems poised to join that elite club: the Jucy Lucy. This creation has gone as far to inspire a restaurant dedicated to the Jucy Lucy in LA called Juicy Lucy (note the different spelling) and Jucy Lucy’s can be found on restaurant menus all around the nation. So it may be surprising that the Jucy Lucy, a cheese-stuffed burger, came from a little dive bar called Matt’s in Minneapolis. 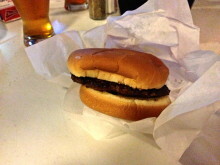 The Twin Cities may have a few claims to their name, but none so big as the Jucy Lucy. This burger stuffed with cheese may have originated at Matt’s Bar, but many other Lucy spots have grown from there and tried to make improvements to an already incredible creation. Despite my desire’s to visit Matt’s Bar, I was convinced by a lawyer (typical) to head to Blue Door instead, as Blue Door is one of those places that supposedly took the Jucy Lucy to the next level. Ever since I learned of the existence of the Juicy Lucy, my life goal has been to chomp down on one myself. Just to tear it open with my teeth until the insides flowed out was something I thought would give me great pleasure. You see, a Juicy Lucy is something special and not-surprisingly comes from the Midwest. Minnesota to be exact. Rather than being content with the old ways of the cheeseburger, the innovative Minnesoootans decided to stuff their burgers with cheese, giving the burger a molten core of cheese just waiting to be unleashed. 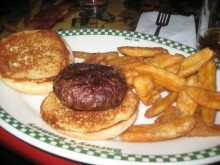 That is the essence of the Juicy Lucy and although I assumed I would have to make one on my own because I live far from Minnesota, I managed to find it on the menu at Barney’s Beanery in West Hollywood.